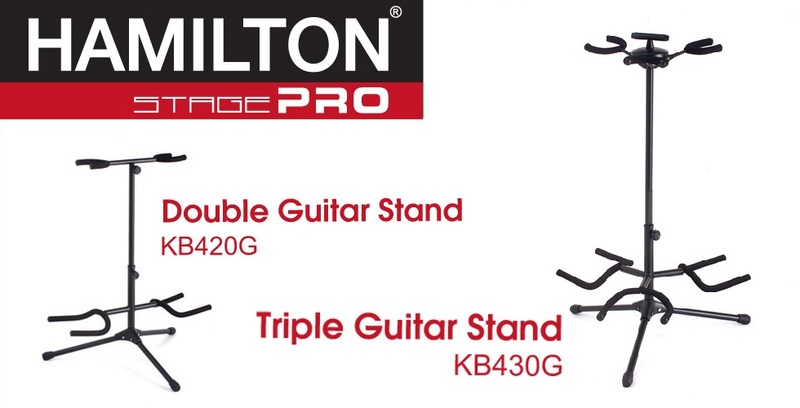 Due to popular demands, Hamilton is adding two multiple guitar stands to their StagePRO series. The KB420G Double Guitar Stand and KB430G Triple Guitar Stand are designed as traditional cradle-rest stands - in which the guitar body rests on a large yoke at the base while the neck leans into a smaller yoke at the top. Thanks to this proven design, the stands remain stable even when loaded unevenly with one or two instruments. Both stands feature a large tripod stand base for stability. The triple guitar stand includes a handle at the top to aid in carrying the stand loaded with instruments. These stands fold up for easy transport and storage. All removable components, like the cradle yokes and neck extensions, are keyed for easy, fool-proof assembly. Body and neck rests are covered in a finish-safe satin rubber and the steel frames are powder coated in "stage-friendly" black.